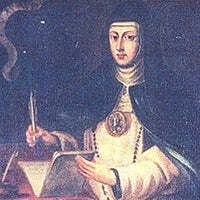 Mary of Agreda was a Franciscan abbess and spiritual writer, known especially for her extensive correspondence with King Philip IV of Spain and reports of her bilocation between Spain and its colonies in New Spain (now New Mexico and Texas). She was a noted mystic of her era. A member of the Order of the Immaculate Conception, also known as Conceptionists, Mary of Jesus wrote fourteen books, including a series of revelations about the life of the Blessed Virgin Mary. Her bilocation activity is said to have occurred between her cloistered monastery in rural Spain and the Jumano Indians of central New Mexico and West Texas, and inspired many Franciscan missionaries in the New World. In popular culture since the 17th century, she has been dubbed the Lady in Blue and the Blue Nun, after the color of her order's habit.